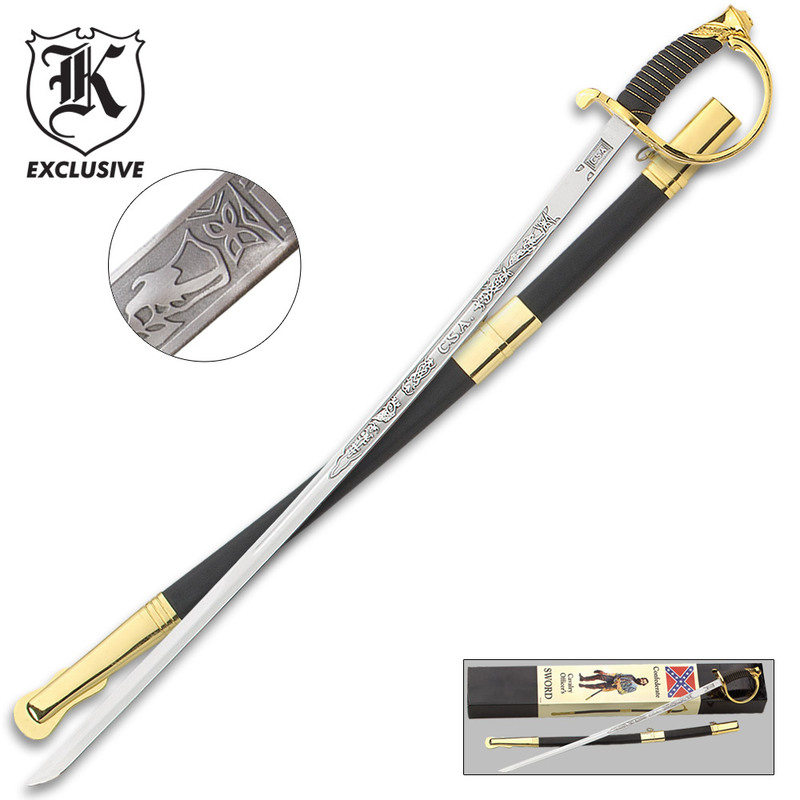 CSA Cavalry Saber Sword | BUDK.com - Knives & Swords At The Lowest Prices! Ride with the boys in gray with a Confederate Cavalry Officer’s sword in your hand! 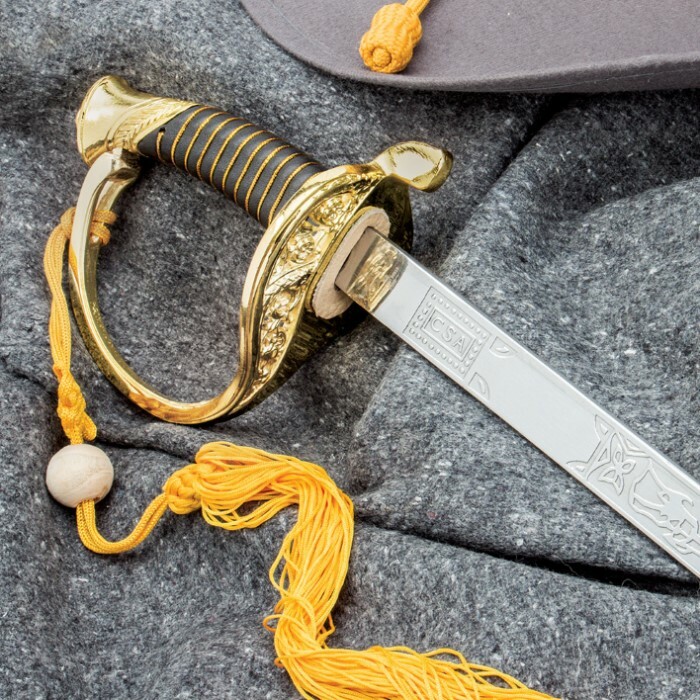 This sword stretches 33 ¼” overall, and features a soft wrapped handle accented with wire wrapping and a brass plated guard and pommel. The 28 ¼” stainless steel blade is ornately detailed with an intricate etching over half the length of the blade. Excellent -Excellent value for the price. Great Value. I'm very impressed. I expected a light replica, but received a heavy, very detailed sword I will proudly display as part of my collection. I ordered the metal glow polish with the sword and will thoroughly polish all my metal swords and s/s guns to protect them. I'm very please with the quality as well as the amazingly low prices. At first look it is very nice although closer examination flaws show up. The grip is a single piece of molded plastic with metalic string wrapped around it to simulate leather and wire. I was expecting the tang to be little more than an inch long with a 1/8th diameter threaded bar that holdd the the guard, grip and blade together but the exposed screw head disappointing. The etching is clearly not etching but rolled on the blade during it's processing and it really detracts from the described appearance. It was what I expected though I'd hoped for better. That said it looks good at a distance or for show. Had I not purchased this as a bogo special I would be truly disappointed. As it is and for what I wanted it's completely acceptable. As a note to BUD K, you really need to be up front in your adds or really step up on the quality control on what you're buying from overseas vendors . I like it, it was full size, sharp looking, had an edge on the blade. I was impressed enough with it that I took down another sword that had actually been used in battle and hung the CSA Sword up in it's place in my office. I purchased 2 of these, one for myself and the other for a Christmas present. The leather on the scabbards is wrinkled and fit poorly. One is very bad the other is moderate. Also, the ad stated "features a leather wrapped handle". Not so, it is plastic all the way. The brass plating does not have the luster that is depicted in the picture. The swords have the appearance of the lower priced swords, of the same design, that are also advertised. I am very disappointed. This sword is Beautiful! I hung it above my Television along with the smaller version underneath it at an offset. You can't tell if it's Union or CSA without taking it out of the scabbard, and for the price it get's a lot of attention. It's a GREAT sword. I like the brass fittings and the blade. However, there were alot of sraches on the blade and the brass fittings on the scabbard. When I first saw them it rather deflated me. But the sword is beautiful and since I use it for practice, I really love it! One other thing, the tip of the handle had two chips on the brass srcew. It appears there was concealed damage because the box was also damaged in the same place. I like the fact that it is NOT BATTLE READY,I do not need it to have an edge. Looking at the blade it would not be hard to put an edge on the blade and the point is pretty sharp. Everyone that has seen it loved it.